If you're just getting into bikes, the smart money has always been buying something used and then working your way up. That's still the case, but there's been a raft of great new entry-level rides in the last year, including the Kawasaki Ninja 300 and Honda's CBR300 (as well as the CB300F). And now there's this: the Yamaha YZF-R3. 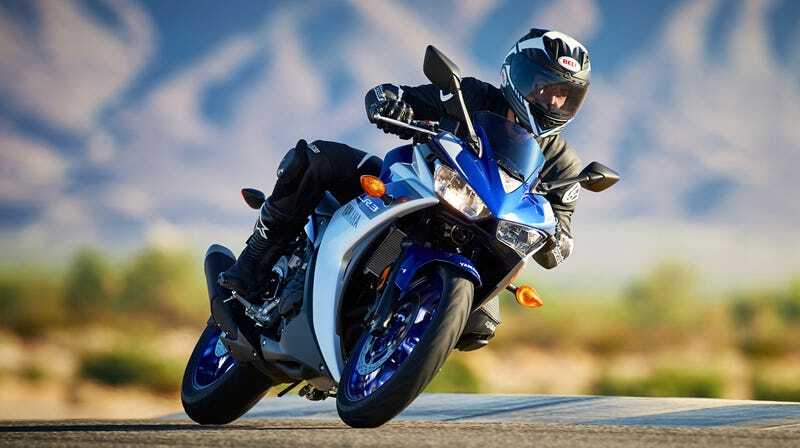 Slotting in below the middle-child of the Yamaha's R-series, the R3 gets a 320cc liquid-cooled inline-two cylinder, with DOHC, fuel injection and friendly curb weight of around 370 pounds. There's no official word on output for the US-spec model, but the Euro version puts out 42 horsepower and 21.8 pound-feet of torque. It's packing KYB suspension at each end, lightweight 10-spoke wheels, a single disc up front, a low seat height of 30.7 inches, and a new LCD instrument cluster. The only thing that's missing compared to the rest of the 300-class pack is ABS, but for a starting price of $4,990, it's a hard bargain to beat when it lands this March.